Jenny and this year's theme. Every year, Heart of the Arts, Inc., managers of the 1912 Center for the community, encourage artists of all ages and skill levels to participate in the community art show that opens the first Friday in February. 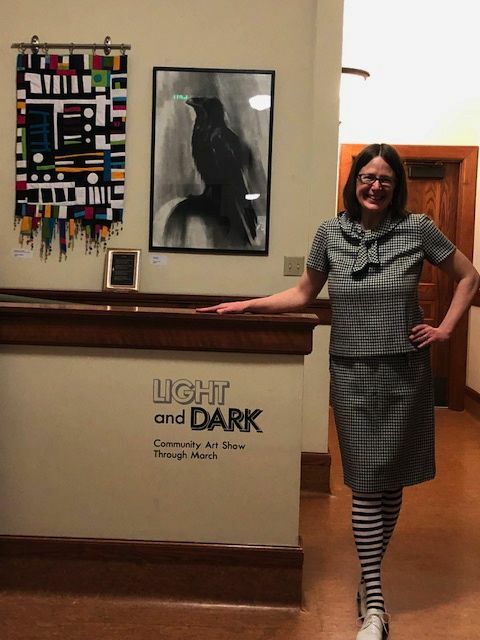 Local artists created works on the theme Light and Dark for this year's community art show that opened on Friday, February 1st. The opening party featured a dark Great Room with lamps on all the tables, Oreo cookies and Milanos, black bean dip with white corn chips and midnight red wine and dark beer enjoyed by the guests while everyone looked at the show. It is wonderful all the ways that this year's theme is reflected in the art in the show. The northern lights. Black and white of a raven and her eggs. Night dwelling owls in their nest. A poem about the light of a flame. Zebra pottery. A snowy landscape in winter. Over thirty artists from our community have explored this theme and the show is a diverse and beautiful way to enjoy light and dark. The show runs through the end of March. Stop by the 1912 Center during hours the building is open, Monday through Friday from 9 a.m. to 6 p.m. and when events have us open in the evenings and on weekends, and see the great pieces made by our artist community. Any piece that is listed for sale can be purchased in the management office and all proceeds go directly to the artists. And thanks to everyone for sharing their talents with the community! Fridays from 9:30 a.m. to 2 p.m. Volunteers with the AARP Foundation Tax Aide Program will be available to prepare tax returns free of charge on Wednesdays and Fridays on a first-come, first-served basis. Program hours are 9:30 a.m. to 2 p.m. through tax season. Tax help is usually located in the Great Room at the 1912 Center but is occasionally moved due to room conflicts to the Arts Workshop or Fiske Rooms. Help continues until Friday, April 12th. No appointments are available so do expect some waiting. The AARP Tax Aide volunteers prepare returns for low to middle income taxpayers of all ages with an emphasis on those who are 60 and older. The IRS and AARP sponsor this program. Please bring a copy of last year's tax return, all tax documents, driver's license and a social security card for yourself and all your dependents. Need more information in advance? Please contact Randy Baukol at (208) 882-5406 or by email at rvbaukol@gmail.com. Do you like making art? Do you want to help us to get the next floor of the 1912 Center renovated? Do you like a little challenge? Then join us for the Tiny Frame Fundraiser and make a little piece of art to help us raise funds for the second floor project! Stop by the 1912 Center management office to select your tiny frame. 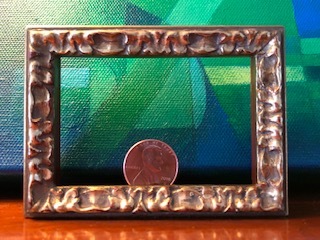 Fill the frame with a tiny piece of art in the medium of your choosing. Bring your tiny piece of art back to the 1912 Center by May 15th and then plan to visit the 1912 Center during artWalk to see the tiny pieces of art. Our community will be able to purchase these little works of art all summer long and all the funds raised will go to the seond floor building renovation fund. Artists who wish to keep the art that they made can make a donation to the building renovation fund to keep their piece. The facility now has all the windows replaced and it looks beautiful thanks to our fantastic community donors' support! Windows may still be adopted for a $1,912 donation that may be made all at once or over time. Leave your own legacy at the 1912 Center with an engraved plaque on the window you choose and help the next construction project at the facility. We may look all renovated from the outside but there are 20,000 square feet of space to get restored upstairs in the building to create more gathering spaces for our community. The roof and skylights were replaced during a project over the summer months of 2018 and the building is all water tight. We are in the process of raising $1 million in funds to be able to complete the second-floor renovations that will include a small auditorium, a community living room, an historic classroom, a game room, bathrooms and more. Come see the spaces on a tour during one of our events so you can see first-hand what your financial gift can do. Questions about the renovation project? 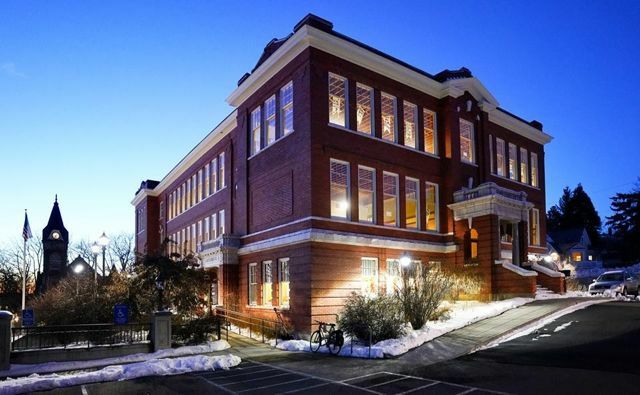 Please contact Jenny Kostroff in the 1912 Center office at (208) 669-2249 or e-mail the 1912 Center at 1912Center@gmail.com and she will happily share with you what is happening at the building. Thank you so much for your support and shared excitement for getting more space renovated inside the 1912 Center beginning next year! In the meantime you can visit our Facebook page for updates on happenings in the building and photo albums of past events in the spaces to help you plan your next event at the 1912 Center. Heart of the Arts, Inc. (HAI) Enriching lives and creating community by operating and restoring the 1912 Center. 1912 Center is open Monday through Friday from 9 a.m. to 6 p.m. Please walk, bike, carpool or use the bus to come to the 1912 Center as parking is limited. Also, be considerate of our neighbors and do not block their driveways.